December 12, 2011 – New York, NY – In 2009, U.S. Marines launched a major helicopter assault on a Taliban stronghold in southern Afghanistan. Within hours of being dropped deep behind enemy lines, 25-year-old Sergeant Nathan Harris’s unit (US Marines Echo Company, 2nd Battalion, 8th Marine Regiment) is attacked from all sides. Cut off and surrounded, the Marines fight a ghostlike enemy and experience immense hostility from displaced villagers caught in the middle. Director Danfung Dennis, embedded as a photojournalist in Echo Company during the assault, captures the frontline action with visceral immediacy. When Sergeant Harris returns home to North Carolina after a life-threatening injury in battle, HELL AND BACK AGAIN evolves from a war exposé to the story of one man’s personal apocalypse. 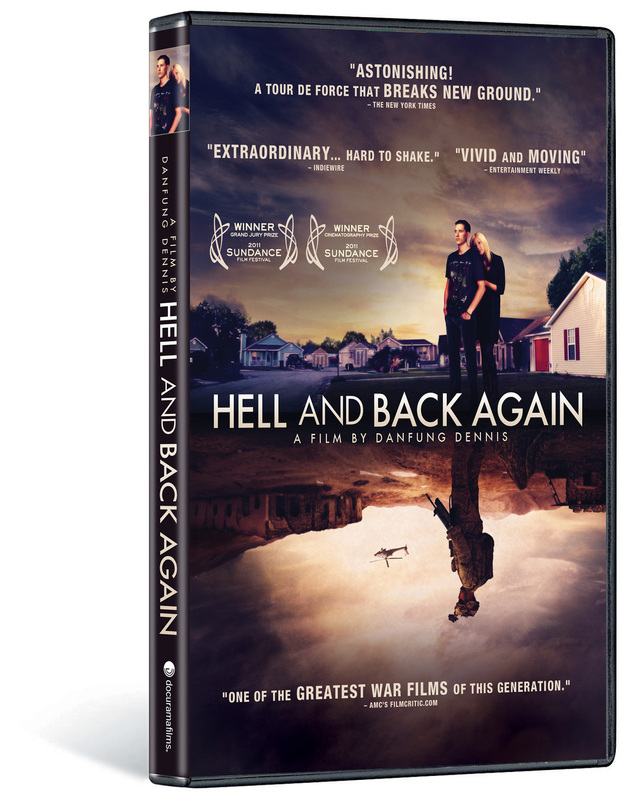 On January 24, 2012, HELL AND BACK AGAIN will be available nationally through a platform release across Cable VOD, digital download and streaming platforms, Blu-ray and DVD. The film will air on the PBS television series “Independent Lens” in May 2012 through a partnership with the producers and ITVS. The “stars” of the film are Nathan Harris and his wife, Ashley (now 29 years old). They are self-aware, articulate, funny and generous. They have shared their most intimate and painful moments with the world in order to help us understand what they and hundreds of thousands like them are going through. Ashley’s role in Nathan’s rehabilitation is a great testimony to what thousands of women are going through, trying to maintain intimacy and normalcy while picking up the pieces of the lives of their husbands, sons, fathers or brothers. Currently garnering critical acclaim in theaters and film festivals across the country, HELL AND BACK AGAIN is Danfung Dennis’s first feature film and the first ever to be shot entirely with a highly customized Canon 5D Mark II digital SLR camera rig. Despite widespread publication of Dennis’s pictures as a photojournalist for several international news outlets, he found that he was unable to convey the brutal realities on the ground – either the public was numb to these same images of war or traditional media outlets were not committed to coverage of the conflicts. This drove Dennis to explore the medium of the moving image. Whereas before he was simply making pictures with movement, now he has combined photojournalism with the tradition and narrative structure of filmmaking. HELL AND BACK AGAIN was edited by Fiona Otway from roughly 100 hours of footage. In order to weave the parallel story lines encompassing the marines of Echo Company during their deployment in Afghanistan along with Nathan’s homecoming in North Carolina, Otway and Dennis crafted a delicate structure that jumps back and forth across different chronologies, physical geographies, subjectivities and psychological landscapes. Composer J. Ralph created the sound design for HELL AND BACK AGAIN using only recordings that Danfung actually captured while in the field. To translate the intense isolation and disorientation that Nathan experienced coming home from war, atmospheric soundscapes were achieved using only basic EQ, reverb, and speed changes at key moments. HELL AND BACK AGAIN premiered at the 2011 Sundance Film Festival and won Grand Jury and Cinematography prizes. The film premiered theatrically in October 2011 and continues to tour nationwide. HELL AND BACK AGAIN is nominated for Film Independent’s “Truer Than Fiction” Spirit Award, 4 Cinema Eye Awards, and a British Independent Film Award for Best Documentary. Danfung Dennis is the recipient of International Documentary Association’s Jacqueline Donnet Emerging Filmmaker Award and the prestigious Alfred I. duPont-Columbia University Award. HELL AND BACK AGAIN is Directed by Danfung Dennis, Produced by Mike Lerner and Martin Herring, Executive Produced by Dan Cogan, Karol Martesko-Fenster, Gernot Schaffler, and Thomas Brunner. Fiona Otway is editor, with music and sound design and original song, “Hell and Back,” by J. Ralph. Bonus material exclusive to the DVD/Blu-ray include: Audio commentary with Danfung Dennis and Fiona Otway; music video for the film’s original song, “Hell and Back,” performed by Willie Nelson; Deleted scenes; PSA for Blue Star Families; Danfung Dennis demonstrating the customized camera gear that facilitated his groundbreaking filmmaking techniques (“Technical Gear Demo”). In 1999, NEW VIDEO launched Docurama Films® with the first feature documentary available on DVD: D.A. Pennebaker’s Bob Dylan: Dont Look Back. Twelve years and 300 award-winning, highly-acclaimed documentary titles later, Docurama continues to discover and release the greatest non-fiction films of our time while spreading the word about filmmakers who are taking the form to new heights. Docurama’s catalog features an array of topics including the performing and visual arts, history, politics, the environment, ethnic and gender interests, and all-time favorites including The Wild Parrots of Telegraph Hill, Andy Goldsworthy: Rivers and Tides and King Corn. Recent titles include the 2011 Oscar®-nominated film, Gasland, and the theatrical release of Hell and Back Again. Celebrating its 20th anniversary in 2011, New Video is a leading entertainment distributor and the largest aggregator of independent digital content worldwide. Headquartered in New York City, with an international presence in 45 territories, the company delivers feature films, TV programs and web originals via digital download, streaming media, video-on-demand, Blu-ray and DVD, and theatrical release. New Video streamlines the distribution and marketing process for filmmakers, producers and brand partners to bring a wide variety of fresh content to new audiences. The company’s library includes original TV series and movies from A+E® Home Entertainment, HISTORY™, and Lifetime®, unforgettable games and trophy sets from Major League Baseball®, storybook treasures from Scholastic®, award-winning documentaries from Docurama Films®, Arthouse Films, and Plexifilm, next-gen indies and web hits from Flatiron Film Company®, the best in Chinese cinema from China Lion, and festival picks from Tribeca Film. New Video is proud to distribute the 2011 Oscar®-nominated films Gasland, Waste Land and, on digital, Restrepo.